Because faneditor The Man Behind the Mask created silent, black and white versions of Episodes I-VI. Stripped of color, dialogue and sound effects, this is a very different way to experience the films. Not only has the presentation of the films been significantly altered, the movies themselves have been severely edited. Partly this is a function of the removal of spoken dialogue; with old-fashioned titled cards simply recapping the action, most scenes don’t need to run anywhere near as long. But the editor has really run with this approach, taking the opportunity to strip most scenes to their basic essentials. Those title cards really strip the dialogue, for good and bad. Short statements replacing the audible mangling of the English language that the films (particularly the prequels) are often guilty of is mostly an improvement. The minimalist approach largely helps the story and removes the fluff. However, the wording on these cards is so sparse and clearly translated from another language that at times they read as too simplistic. Not a big issue, though, as the whole point is that you barely need to understand the language at all to follow these great stories. So, does this approach work? Results may vary. 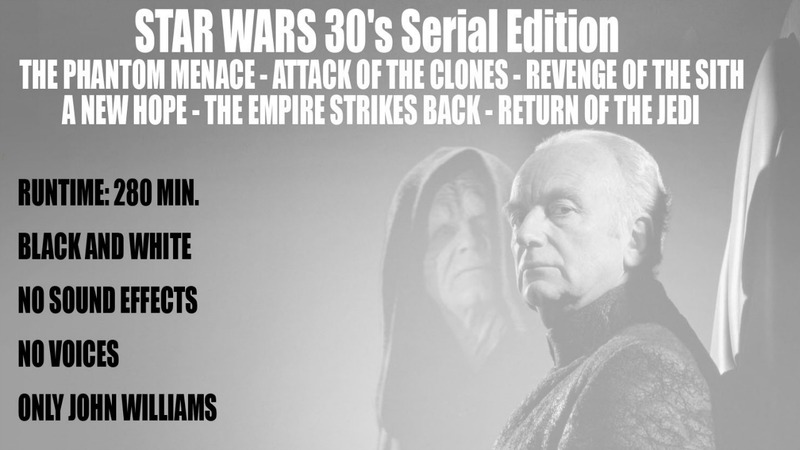 Condensing the prequel films so much is probably extremely welcome for those who don’t really like those episodes. It’s effective even if you are a fan of all the pictures, just not quite as satisfying. They play as Reader’s Digest condensed versions of the stories. The biggest thing missing in these versions of the films is the sound. 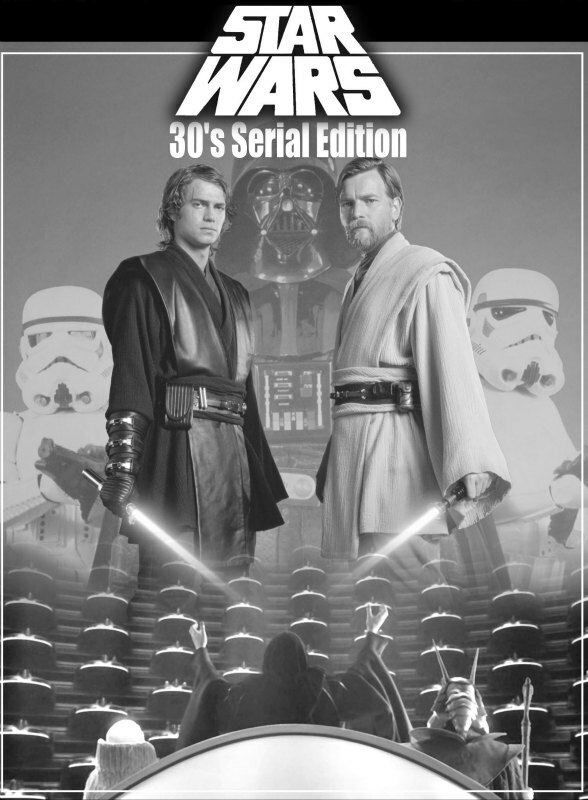 While the John Williams score is wonderful to hear in isolation, the 30’s Serial Edition certainly serves as a reminder of the importance of the Saga’s sound design. Not only are the award-winning sound effects sorely missed, their absence lessens some of the weight of the visual effects. 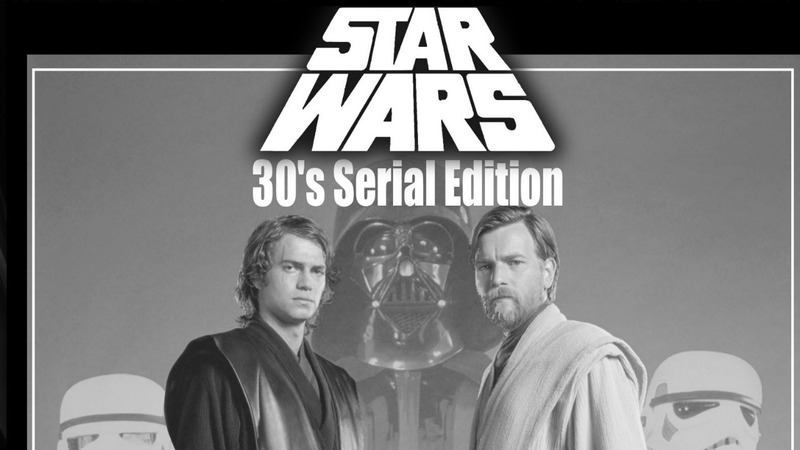 Personally, while I really enjoyed Star Wars: 30’s Serial Edition, it comes off as more of a cool experiment than anything.